Join the IFQ Member’s Club! Be ready to be inspired and INSPIRE others. Before you even think of quit dates, cravings, urges, cessation aids or anything else, you need a plan to help prepare your mind for quitting. Downloaded OVER 16,458 times - This 21-page Action Plan is for those who need to quit smoking and want to do it fast. It will put you on the right track and break quitting into 8 manageable parts...helping reduce your "overwhelm". Tell us a little about you and we'll give you free access to the plan. Then when you are ready‚ join the growing IFQ movement. 1.) How old were you when you started smoking? 2.) Ever TRIED to quit in the PAST? VERY IMPORTANT: Only click the "Yes ... Give Me Access!" button ONCE. Our software will create a unique login and password to our internal site for you within the next couple of seconds. You will be redirected shortly after submitting your info. Use the Action Plan by yourself OR grab the special offer to join our support group on Facebook, so you can connect with others AND receive counseling and support from Board Certified Primary Care Physicians & Licenced Mental Health Therapists Available to you 24/7/365, Nationwide. By signing up you'll also receive access to the "Quitter's Corner" newsletter, exclusive offers, event information and helpful tips. This 8 Step Action Plan to Quit Smoking gives straightforward guidance and lays the foundation to leaving cigarettes in the past. 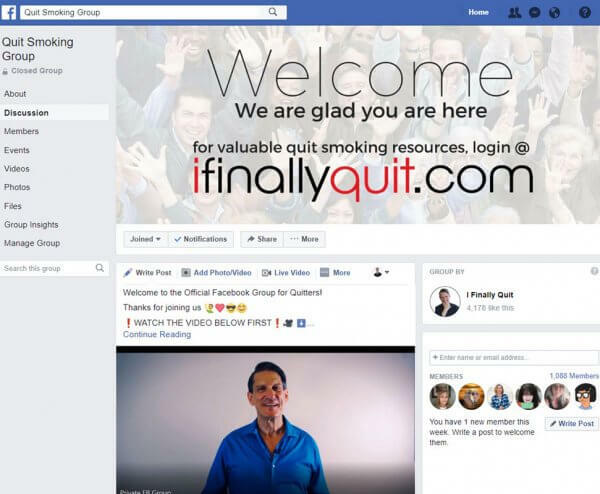 Join the IFQ community through our subscription-based members club that offers encouraging, judgement-free support from others on their quitting journeys. 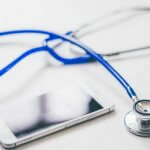 Connect with Board Certified Primary Care Physicians & Licenced Mental Health Therapists via phone or video ANYTIME, ANYWHERE with Remedy.Me to reach your goal quicker with a detailed, personal plan. Be inspired and ready to inspire. Club members receive loving, caring support from our community; cheering each other on, as well as quarterly "high fives" delivered to their door* to celebrate milestones. 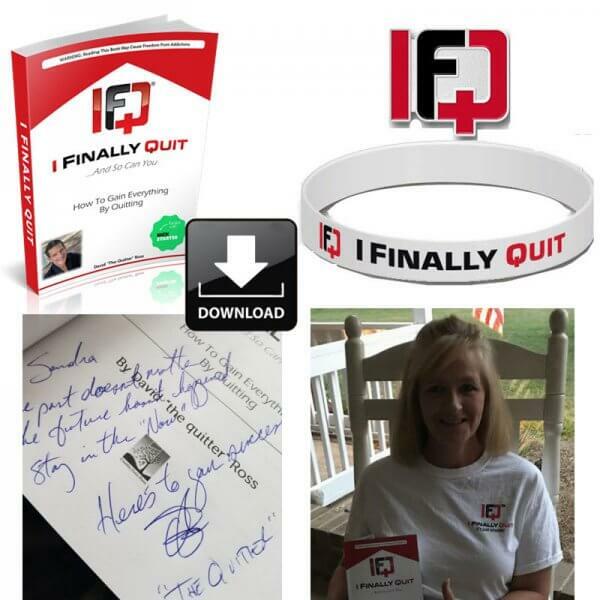 Get the book that's changing the way people quit ... and stay quit for life! David "the quitter" Ross shares his a compelling story of excess and loss of control to redemption and helping others. This book is for anyone who has ever wanted to break free from ANY “bad” habit. It will leave you inspired. This book and community are for you! *BONUS quitting resources along with ACCESS to our online community with your signed copy! *includes FREE shipping of quarterly motivational "high fives" for US residents. Our international friends receive shipping discounts and are billed separately each quarter. We offer training packages to support people — before, during and after quitting. Join our member’s club and move at your own pace OR get direct coaching to reach your goal quicker. Either way, we’ll meet you right where you are and we’re with you every step of the way! 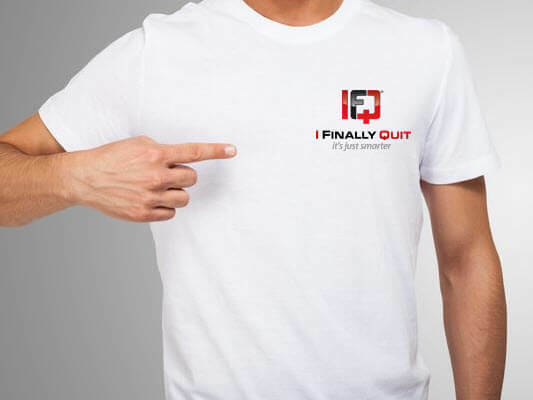 Online Training, Support & "High Fives"
Sign up for the program that’s helped countless people get started quitting. 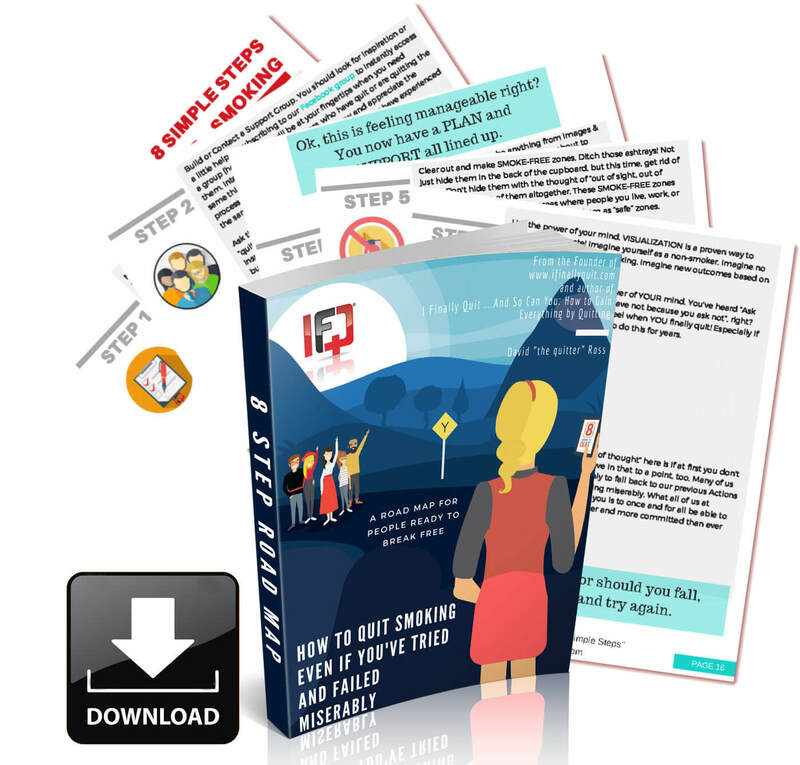 You will receive downloadable videos, MP3s and worksheets that walk you through an easy and transformative 8-step process to getting real results. Join the IFQ community for support, answers, guidance, and inspiration. **first-time Audible users receive free audio book from Amazon. *includes FREE shipping for US residents. Our international friends receive shipping discounts and are billed separately each quarter. 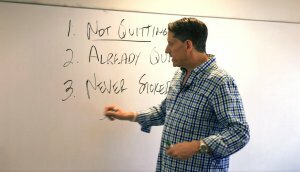 Work directly with our Founder, David 'the quitter' Ross, as he coaches you through the proven, step-by-step system to creating real change in your life. You will receive the same system he used to eliminate a myriad of "bad" habits from his life; launching the I Finally Quit movement. The key to success in any quitting campaign is creating visual and physical awareness of your NEW actions and behaviors. 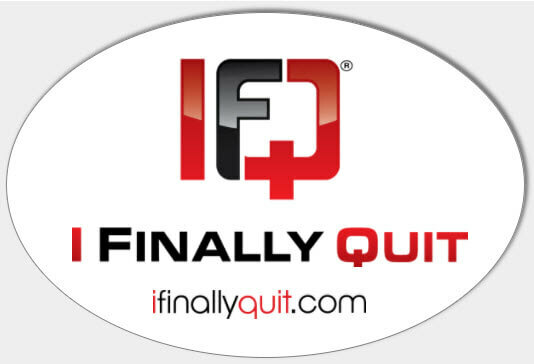 IFQ Stickers - Perfect for labeling your change jar (of your saved money), favorite water bottle, computer, mirrors or anywhere else you would like to be reminded of your smoke-free commitment. IFQ Commitment band - The IFQ band signifies your personal commitment. Wear it with pride. 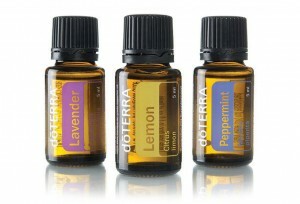 The Introductory Kit includes a 5 mL bottle of dōTERRA's CPTG Certified Pure Therapeutic Grade® lavender‚ lemon‚ and peppermint. You'll find the basic trio of essential oils to be EXTREMELY helpful in getting past cravings and anxious feelings‚ when quitting. With more than 100 "doses" or drops per bottle, this essential oil kit has enough essential oils to get you through your quitting journey. Don't want online trainings, support, answers, guidance, and inspiration? Still want to try and quit all alone? Get the "do it yourself" plan. Q: What if my specific concerns are not addressed? A: We will do our best to answer all questions daily in our member's group and you may ask your specific questions to our founder David 'the quitter' Ross during the weekly live Q & A each week. 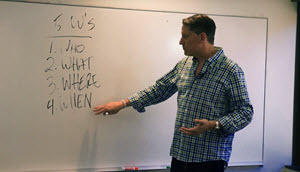 You may also email or text David directly, so your questions get answered. A: Yes, your subscription is free to end at any time you no longer need or wish to give support. However, please note that refunds for the previous time used are not allowed. Q: How long will it take to get access to the materials and member's group? A: All digital and audio** downloads will be available for immediate download! — well, within 60 seconds while your profile is created 😉 **Free Audible download from Amazon is available for first-time audible users and is delivered upon audible account creation. Access to the member's group is usually granted same day as requested, 8AM - 6PM Pacific, Monday through Friday. Quarterly "high fives" are delivered or shipped every three (3) months. A: Each 4 week course begins the first Monday of the month. Access will be granted then. Physical items are delivered or shipped during the first week of the course. Q: Can I download the content? A: Yes, you will be able to watch the videos, listen to the audio files, and/or read the downloads. Q: How will I access the downloads? A: You will receive a unique User Name and Password to our MEMBERS ONLY site. Once there, you will have access to free audible download link and Facebook member's club link. A: Yes, of course. We have a "love it or keep it" guarantee with the purchase of our products and access to our member's club. Although we cannot guarantee you will quit smoking (that parts on you), we can provide with with guidance and encouragement. In other words, if for some reason you are dissatisfied with the technology‚ recording quality‚ or ...anything‚ just let us know within the first 30 days and we will give your money back AND you can keep it all anyway (minus access to the Facebook group)! Q: Do I have to join a membership? A: Of course not — membership isn't for everyone. If you just want the inspirational book I Finally Quit …And So Can You: How to Gain Everything by Quitting that is changing the way people break free from procrastination, smoking, drinking to excess or any other ‘bad’ habits, you may get it HERE. I personally am a member of IFQ and I want to just say THANK YOU Dave! I have quit smoking after 30 years and this site has been a huge help.It was a wonderful resource to talk to others who knew what I was going thru because my family just didn't understand how hard it was for me! I feel this site was a true Godsend for me and my health! I'm going on 3 years smoke free and again just want to say ... Thanks! 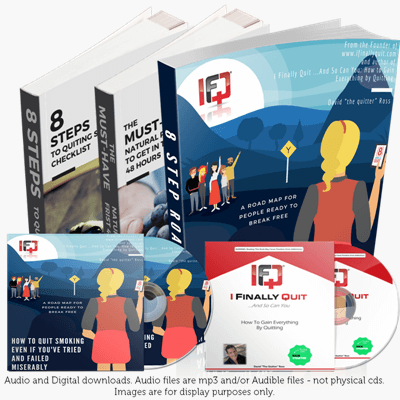 David Ross, his 8 step action plan, the IFQ support group, and all of the resources David has offered including his book have been instrumental in motivating, inspiring, and helping me get to my final quit and why I am so glad I joined the IFQ Movement. I feel alive again for the first time in many years thanks to David Ross and I Finally Quit. His eight-step action plan has become an almost daily reference for me - it reminds me of what I have accomplished thus far - and the life I will continue to live. The support I have been given from David and other group members is a lifeline for me. I truly have a new lease on life - and best of all - I don't feel frightened any more! Eternal gratitude! I love how everyone is so positive and supportive. I didn’t post much but believe I have read posts and found support. Over 200 days clean! Thank you all!! I realized today usually my routine was tied to when I could smoke etc. I realized today I am finally free of that. The overwhelming support of everyone here. This isn’t a quit smoking support group, this is a family of supportive people!!! I'm David 'the quitter' Ross and I've encouraged thousands to say "I Finally Quit". QUIT SMOKING LIKE YOUR LIFE DEPENDS ON IT. YOUR LIFE DOES DEPEND ON IT.